Lace is so on trend at the minute! It is seen everywhere from interiors to weddings to cakes! It is surprisingly easy to create a lace effect on cakes, biscuits and cupcakes, and all it requires is some Royal icing, a piping bag and a small paintbrush. Royal icing dries hard so it can hold its shape, making it perfect for intricate patterns. Hopefully this step-by-step guide will show you how to create the pattern of the moment! Roll out some fondant icing in the colour of your choice, to a thickness of about 3-5mm. Any thicker could make the cupcake too sweet. Using a round cutter similar to the diameter of your cupcake, cut enough circles out of the icing. Grab a cupcake, trimming the top if it is very uneven, and spread a little jam on top so that the icing will stick. Cover the cupcakes with the fondant icing circles and begin to prepare the Royal icing. Mix half a cup of Royal icing with 1 teaspoon of water. You want to create a thick paste that will keep its shape when you pipe it, but will not be impossible to squeeze out of the piping bag. You can thicken the paste by adding more Royal icing sugar, or loosen it by adding a couple more drops of water, being careful that you do not add too much water. Also bear in mind that if you are changing the colour of the royal icing with a liquid food colouring, this can change the consistency of the icing and you may need to add more of the Royal icing sugar. 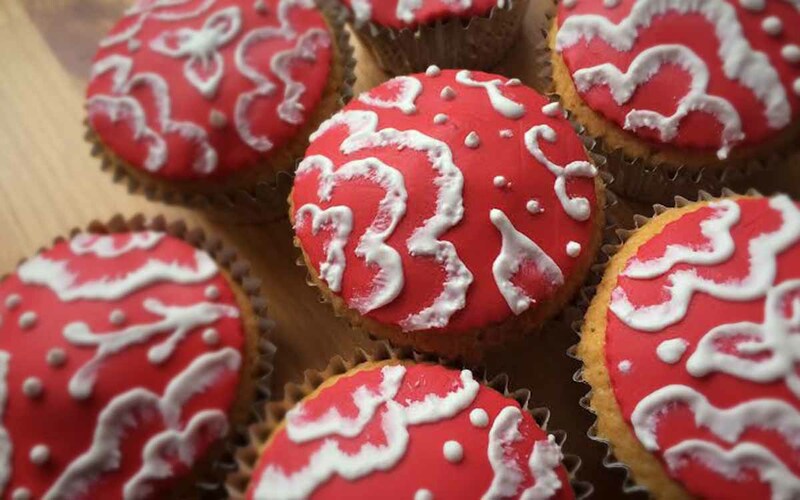 Insert a fine nozzle into a piping bag or cut a tiny hole at the bottom of a disposable piping bag, it should be small enough to create a fine pattern but big enough so that you can squeeze the icing out. Spoon the prepared Royal icing into the piping bag and seal the open end with a food clp to avoid spillages. It is important to plan your pattern before piping. Pipe a frilly outline of a flower shape onto the iced cupcake. Now, using a clean and dry, short-bristled fine tipped brush, drag the inner half of the piped icing carefully towards the centre of the flower shape. Occasionally you may need to wipe excess icing off the brush onto kitchen paper. Pipe a second smaller frilly layer inside the first outline and repeat the dragging process. Be careful to only drag the inside edges of the frilly outlines and not damage the outside edges as this would destroy the lace effect. Once you have created all the lace shapes, you can add a few piped dots and lines to add interest and detail. Layering Royal icing helps to make the icing look more realistic and look three dimensional. Shimmer powders are a great way of highlighting edges and giving a polished look. 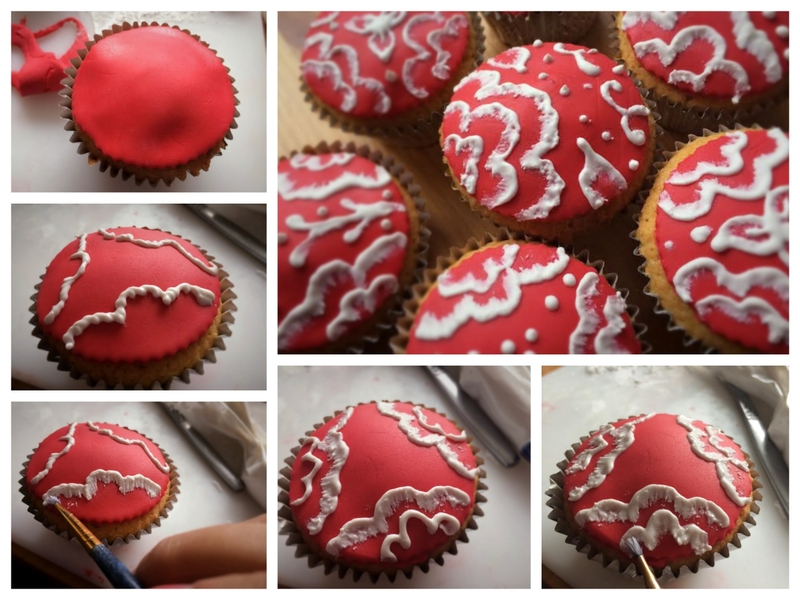 Have you tried decorating cupcakes, biscuits or cakes with lace? Share your creations with us below or via Facebook or Twitter. Should You Invest in an Interior Designer?